This year my puppy needs all my attention, so my front garden is having to thrive mostly without help ! More front garden pics on my new blog. Looks to me it's doing prety well! Looking very pretty. May I ask what is the redish/orange top right.. Thanks Amsterdam, Bathgate and Gnarly ..
the top right red/orange are tulips. My goodness...and it looks this good without you? That's fantastic! Fantastic show Tt, I think you should put this into GoYpedia spring, Derek. Your garden is looking fantastic. not sure if GoYpedia Spring is one of my categories ... I had a look, Derek, thanks, to find a suitable page, and found Rockery Ideas. Great, well done, ? Derek. 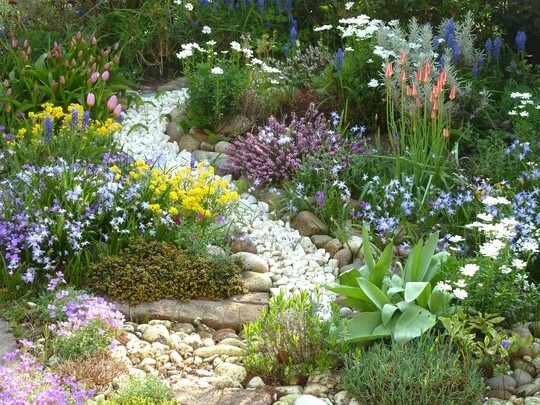 Looks lovely those stones look like a stream flowing through the plants nice touch. the stream idea worked out better than I had expected. So pretty & the stream idea is great. Hope pup is behaving himself! I couldn't improve on this if I planted them myself. beautiful! i like the added stones, they set it off nice, and the way the rolls of flowers are!!! Thanks so much for your interesting and kind comments ... I love natural-looking gardens and have tried hard to maintain that style of design. Its absolutely beautiful Terra, it really is lovely. Yes, it really is a delight. 'Gold Medal' at Chelsea without a doubt!! !